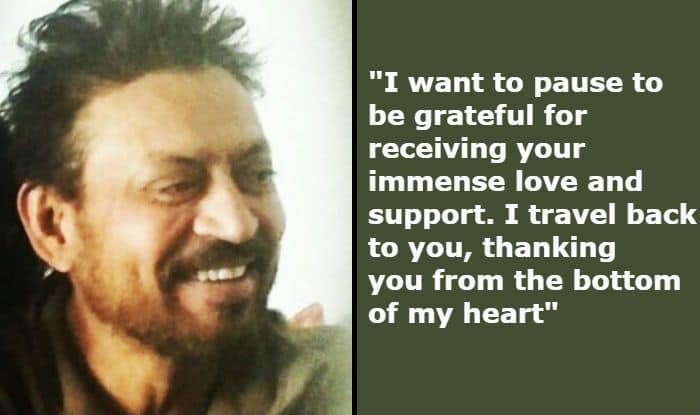 Irrfan Khan posts a happy picture of himself on social media along with a note announcing that he is finally back to be with people who love him unconditionally. The actor is expected to begin shooting for Hindi Medium 2 soon. Irrfan will reportedly be joined by actors Kareena Kapoor Khan and Radhika Madan on the sequel to his 2017 hit film. It’s being directed by Homi Adjania, who has earlier helmed films like Finding Fanny and Cocktail. While Irrfan hasn’t talked to the media for long now, his friend and filmmaker Tigmanshu Dhulia revealed that the actor is gearing up to take over the screens soon. It was in March last year that Irrfan had announced he was diagnosed with a neuroendocrine tumour. He stayed away from both the social media and the cameras since then. We wish him the best ahead!